Dolores is taking part again in our recipe competition. And we’re delighted, because today she is surprising us with a refreshing combination of sardines and ajoblanco, with a touch of apple confit. We encourage you to try this recipe at home. For the ajoblanco, mix the broken up bread, the peeled garlic clove, the almonds, the salt, the vinegar and the oil. Blend until a very thick cream is achieved. Add water until you achieve the texture you want it to have. Peel the apple, cut it into small dice and stir-fry it in a frying pan with a spoonful of olive oil. Pour the ajoblanco on the bottom of the plate and place the sardines on top. 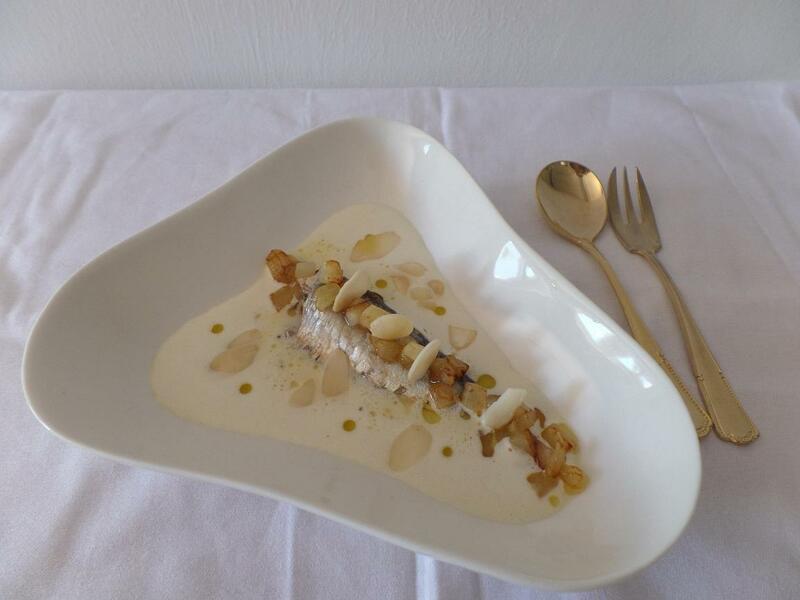 On each sardine, make a line with the apple stir-fry and decorate with laminated almonds. Original and refreshing! Thanks Dolores! Buenísima! Para chuparse los dedos! Menuda presentación, que elegante y atractiva. Así no nay quien se resista. Uhmmm…además de estar muy bueno, es sanísimo. Así me gusta alimentarme. Saludos, felicitaciones por tu receta. Me gusta, me la guardo!